If you’d like to get a handle on some of the deeper thinking around Conscious Business, you might find it useful to buy and download a copy of the latest issue of eO&P. We think this is probably a world first – an issue of an academic journal dedicated entirely to Conscious Business. What I really like about AMED is its focus on research and practice. 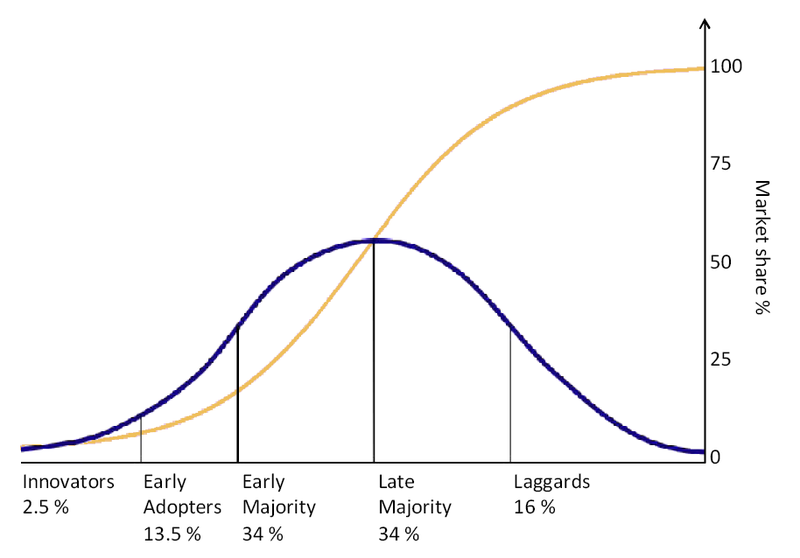 Remember Everett Rogers’ bell curve – the diffusion of innovation? If you’re at all interested in Conscious Business you’re probably an innovator or an early adopter. Conscious business is still very early in the adoption life-cycle – indeed the term only really emerged a few years back. Now research is really useful, but I believe that research combined with testing, practice, experimentation is the way to really get to the heart of a new innovation. To find out what it is good for. It’s strengths and weaknesses. How to mitigate those weaknesses. How to refine it – and pivot if necessary. I believe it is only through real immersion in the practice of something that we can properly get to know it. eO&P is not a peer-reviewed journal. I like that too. Peer-review has its strengths. But Kuhn’s famous work on paradigm change has shown us that there are dangers too – that elites can, for example, suppress the emergence of new ideas. And that this can slow innovation and hence paradigm change. Most of the academic publishing houses seem to be very conventional businesses. Where will the energy to overturn the existing paradigms come from, if not from us? Not being peer-reviewed doesn’t mean that we (@smilerob and @peteburden) didn’t work very hard to ensure the quality of the pieces. We did. And the authors did a fantastic job too. Some had written for journals before but for others it was a totally new experience. All brought their practical, hands-on experience as well as critical thought to the project. We’re really proud of every piece, and of the overall outcome. I’d also really like to thank the publisher of eO&P, Bob MacKenzie and everybody at AMED (especially David McAra) for their massive help and support during the publishing process. We’re currently starting work on the next edition and we’re looking forward to that collaboration too. So please take the trouble to download a copy, or better still if you are really interested in supporting the development of management and leadership education please consider joining AMED. There’s an annual subscription option at their website. Categories: Awareness, Business, Capitalism, Caring, Conscious, Courage, Culture, Education, Leadership, Learning, Management, Paradigm, Partnership, Purpose, Reflection, Sustainability, Thinking | Permalink.